Our back deck has a number of regular visitors. There’s the rainbow lorikeets who cling to the fly screen and screech at us demanding breakfast. There’s the possum who comes every evening to clean up anything the birds leave behind. There’s the crimson rosella who with great daring braves the wrath of the lorikeets to try for a share of the apples and bird seed (it never works, those lorikeets are fierce!). 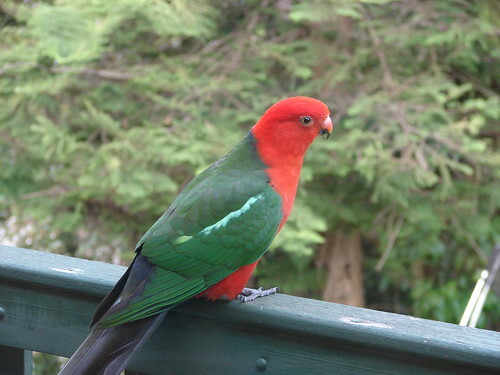 And very occasionally we get the King Parrots who are regulars at our neighbour’s back deck and rarely grace us with their presence. One of them dropped in yesterday when the kids were doing their homework and for once the camera was in a sensible spot. We also get plenty of cockatoos – one year we had 2 chicks take up residence in the backyard and persecute the cats. There’s nothing funnier than a huge cat being chased by a half-naked bird. A tawny frog-mouth can sometimes be seen perched on the clothesline, Kookaburras hang out in the pine tree in the back corner of the yard, and just a few weeks ago Adam saw a huge owl sitting on the gutter at the front of the house. We even had the brush turkey drop in for a visit, Clara was intrigued but wary, she wouldn’t go out into the yard with it there – not that I wanted her to! The door was open and at first I didn’t know why she was refusing to go out. When we first moved here there was a big tree with red flowers outside the building where I was working and it was full of Rainbow Lorikeets. I would spend at least 10 minutes gazing at them every time I passed by. Everyone else thought was crazy but they were so beautiful and noisy. Ohhh, they’re so beautiful! Lookit. N’aw. I can’t imagine living in a place that had actual wild parrots hanging out. It would be so incredible. Do you ever begin to take it for granted? I miss these birds as well. We only get boring brown things here. Definitlely one of the better things from Australia. I confess to a slight bird phobia – something about fluttering wings. But these are gorgeous.Maybe I could be cured if we had these in our back yard. 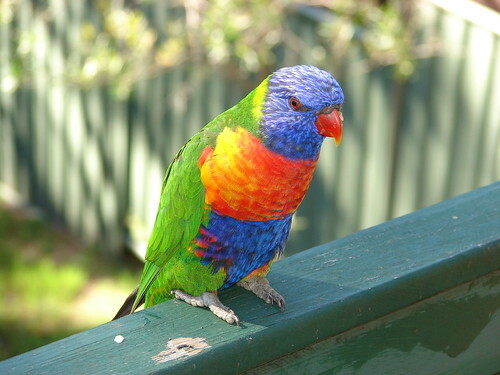 Mum’s old house had a bird feeder which attracted at least 50 birds every morning, mostly Rainbow Lorikeets. Eventually though, we decided it wasn’t good for them to be fed every day, and cut down to twice a week. They still came though when the food was out. Sharp-eyed, or what! It’s magpie season here. I love the babies. They’re so cute! Oh, wow. Beautiful. Makes me feel sorry for the little birds in my backyard.